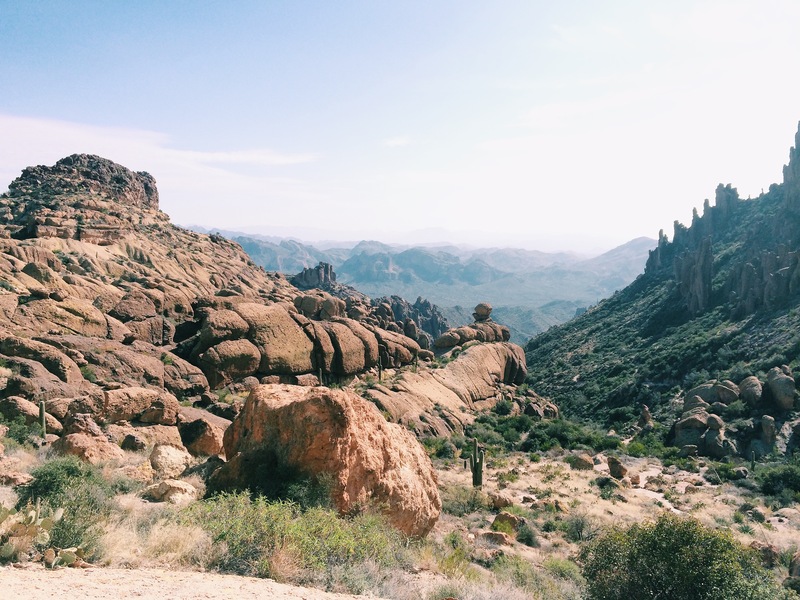 One of the adventures we had planned on this trip to Arizona was a day of hiking in the Superstition Mountains. 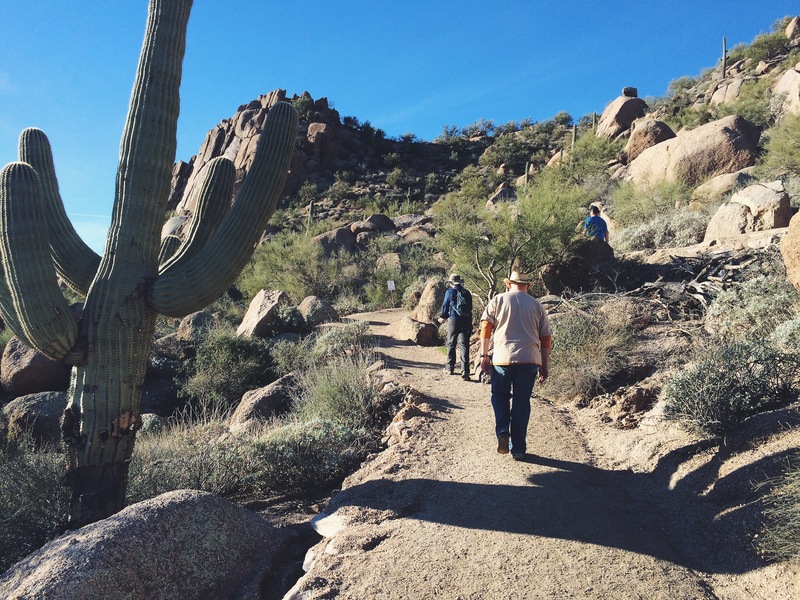 Since we’ve always gone to Arizona in the dead of summer, hiking has never been an option. 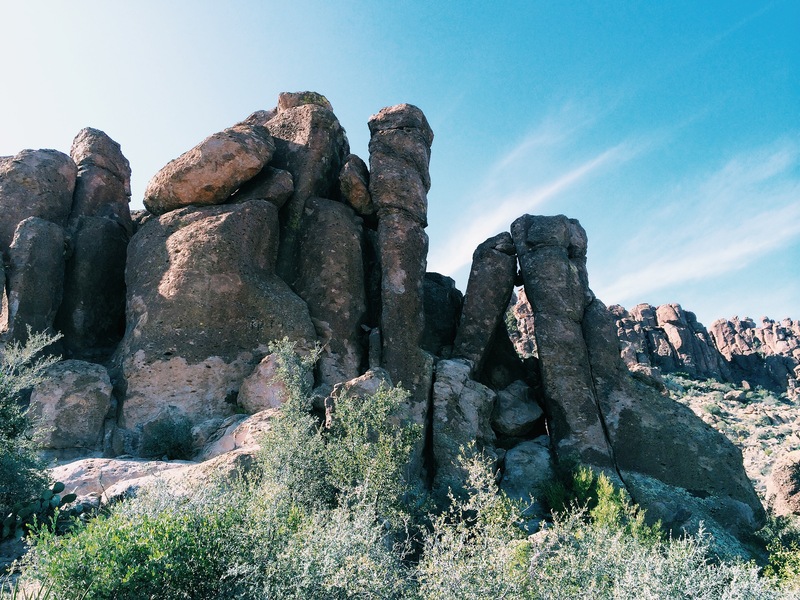 Now that dad lives out in the middle of nowhere (Queen Creek) the Superstitions are just a quick drive from his new house and so we headed out one morning to tackle the Peralta Trail. 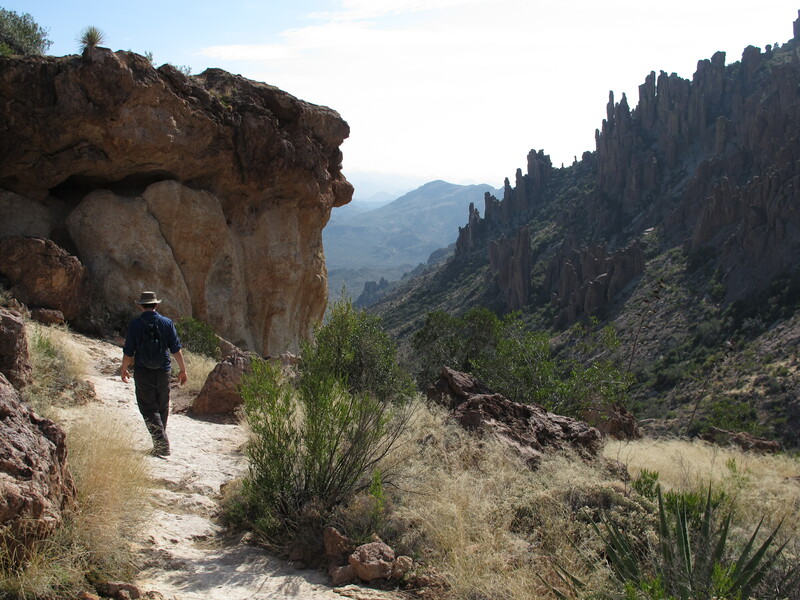 It was the perfect length (almost 5 miles or so- round trip) from the trail head to the saddle view of Weaver’s Needle. According to my dad, I’ve been on this trail before when I was younger (under 12) when I backpacked in with my dad and a group of other backpackers. I didn’t remember of course. The road to the trail head is dirt but a there is a large parking lot and bathroom facilities There is no water available though to refill your containers with so plan accordingly. I read numerous sources that said there was a parking fee but when we went the parking was free. 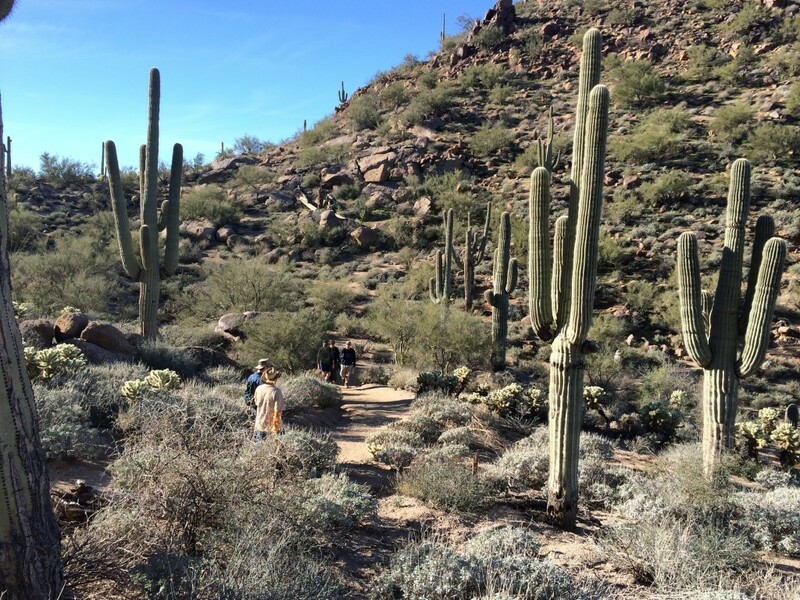 Apparently Peralta is the most popular trail in the Superstition Wilderness and can be very busy at times . We went on a Tuesday and it seemed pretty quiet to us. We passed a few people but after hiking the Pinnacle Peak Trail just days before, this one was so quiet and peaceful. (with the exception of the guy who was hiking while blasting his music- we let him get way ahead of us so that we didn’t also have to listen to his bad music choices). The views on this hike are amazing. 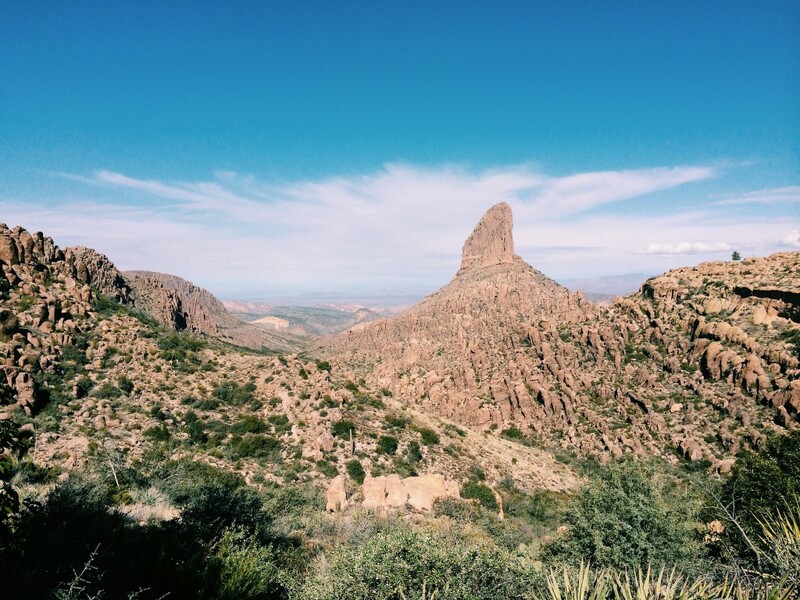 The saddle with the view of Weaver’s Needle was awesome but I think almost every view on the hike was breathtaking. It’s so different from what we usually see on the Central Coast and it was a welcome change. It’s a pretty easy hike even with the noticeable elevation gain. It’s gradual for the most part and didn’t give me any problems at all. I think the biggest hindrance of the day was the weather. Cool weather in Arizona is like hot weather where we live and so by the end of the hike we were exhausted and had both run out of water. I can’t believe there are people who would do this hike in the dead of summer. Even in January it was almost 80 degrees midday. I would suggest doubling the amount of water you think you might need. I had also misjudged the amount of time it would take to do the hike and didn’t bring lunch food with me and so the last half an hour of the hike was pretty rough on both of us (me because I was so cranky and Nate… because I was so cranky) If you find yourself in this part of Arizona I highly recommend that you explore this trail. You don’t have to be in amazing shape to do this hike but you should be, at the least, at an average fitness level. Beginner hikers may find parts of the trail tough. There are some narrow parts and the trail is not marked in any recognizable way but is still pretty easy to maneuver. Nate is a natural with hiking and he always seems to know exactly where the trail is even when it’s not obvious to me. After we got to the top of the saddle we explored a bit around the area (adding another mile or two to our final total) as Nate was hoping to get closer to Weaver’s needle. It’s much further than you think it is though and after walking an additional mile or so we decided to turn around( due to my lack of food). Hike length: 4.9 miles to the Fremont Saddle view (round trip) Elevation gain: 1380 Trail condition: excellent even though it is not marked in any way . 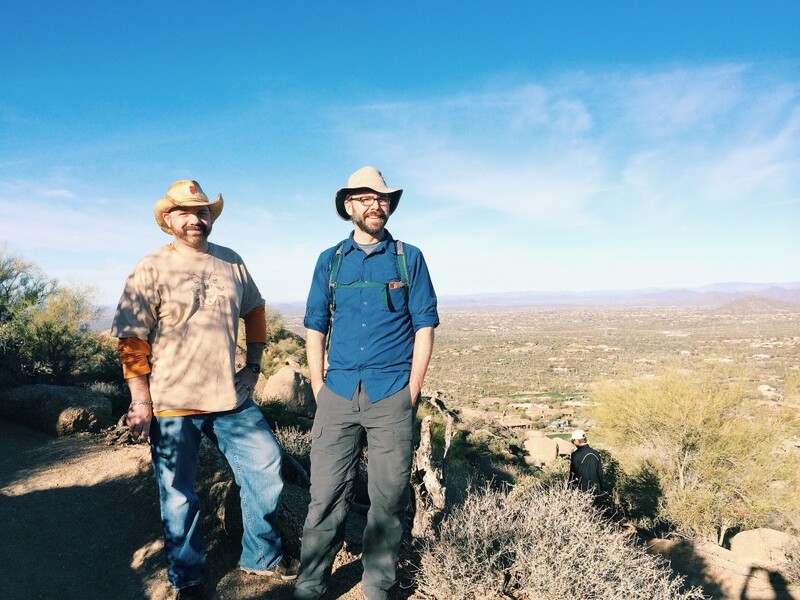 Now that we’ve pretty much stopped drinking we find that we are often filling that time with hiking. (Actually, friends have also noticed this and pointed it out to us too , which is pretty funny) When I plan trips now, I no longer look for breweries or drinking establishments, I look for hiking spots. It’s our new favorite way to spend time together. There is no doubt, in either of our minds, that this is a much better way to spend our time together. I feel so much better and being outdoors and active is so much better for us as a couple. Traveling has changed a bit because of this lifestyle change though. We normally make it out to Arizona at least once a year to see my family but in the past it’s always been in the summer ,mostly because of Alex and school, and because my dad had a pool. Not a fancy pool by any means but a pool that I have enjoyed on and off for the past 25+ years of my life. He sold that house though and opted for a new house, in a new housing community, where the pool is a community pool. Now, I don’t have anything against community pools per se but the convenience of rolling out of bed, donning my swimsuit and jumping into the pool by 9:00am is gone. I am a little heartbroken about this still, btw. 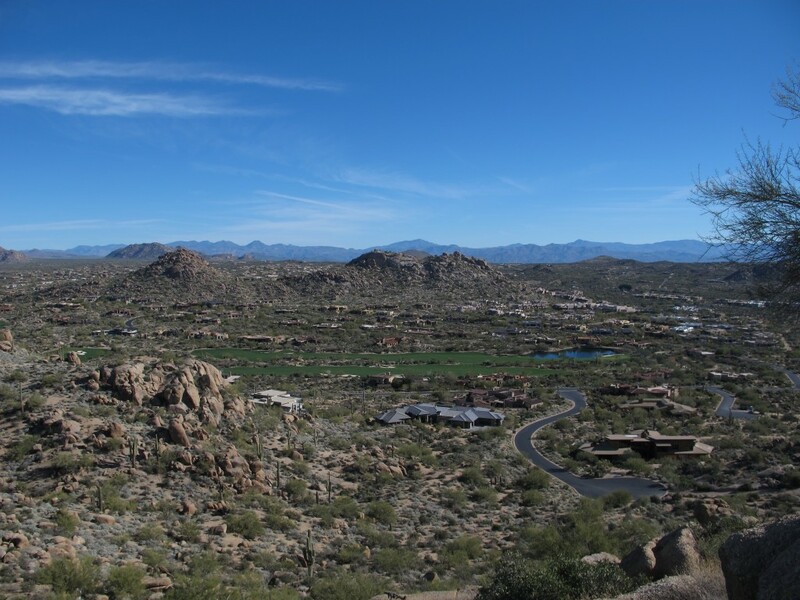 Anyway, because of his residence change, we opted to travel to Arizona in January this time. This worked out better with our current lifestyle too. In the past we would spend our time in Arizona visiting breweries and hanging at the pool because in Arizona, in the dead of summer, there isn’t much else to do. 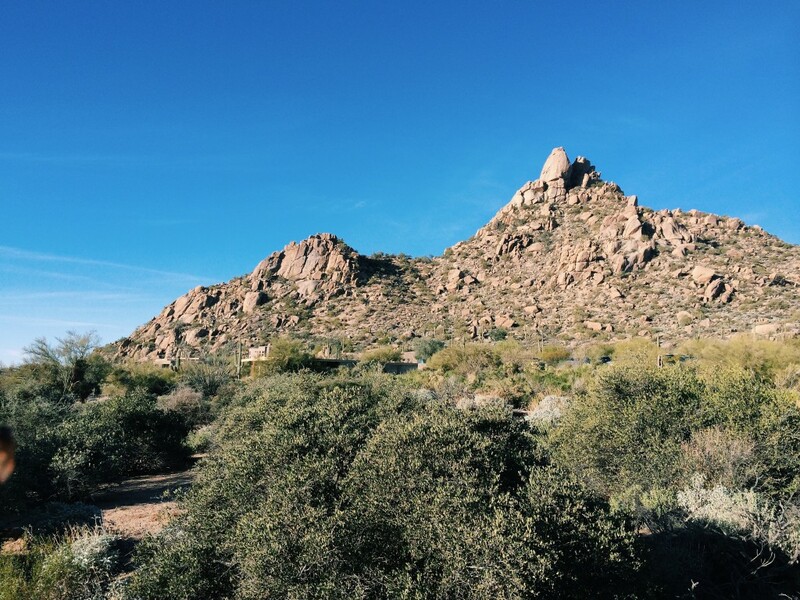 We stayed with my sister in Scottsdale for the first few days (my dad moved out to the middle of nowhere) so that meant our first hike needed to be near or around Scottsdale. Nate had already done Camelback Mountain years ago so I was looking for a hike neither of us had done before. Pinnacle Peak seemed like the perfect hike to start with. Not too long. Not to far from my sister’s house. (Nate hates how spread out everything is in Arizona). I read a few things about the hike and it seemed like it would work for us. 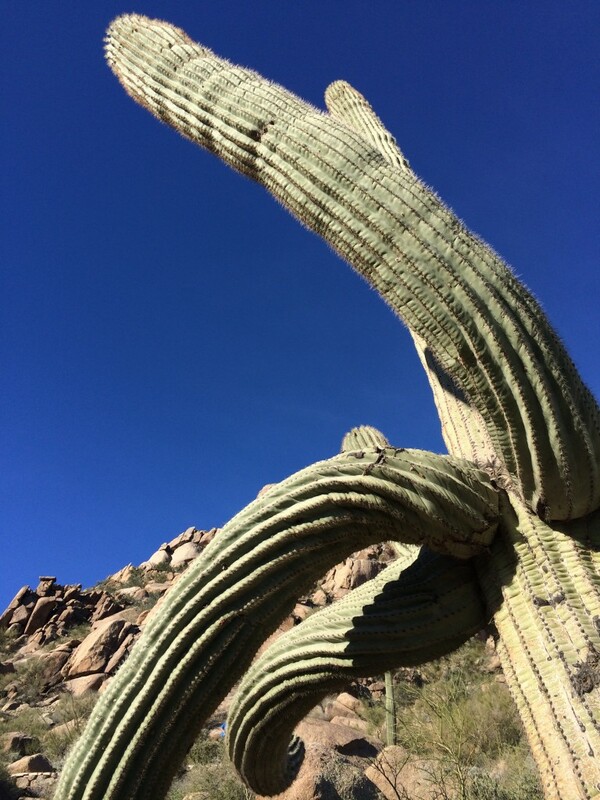 Even though the weather in Arizona this time of year is wonderful it’s still 10 degrees more than we are used to. I had read that this hike was busy on weekends but I was not prepared for this kind of busy. It was almost like a conveyor belt of people. There was always someone right behind you or right in front of you. The hike itself was great. It’s been referred to as the “stairmaster” hike and that name fits it. It’s a steady climb up to the peak (1300 ft elevation gain) and the trail itself is only 3.5 miles round trip but the views of the Valley are great. The houses out there are amazing too. We spent some of our time discussing which house we would live in if we had that kind of money. It’s a fun hike but if you are looking for a one without tons of other hikers, this is not the trail for you. Can’t beat the view though. 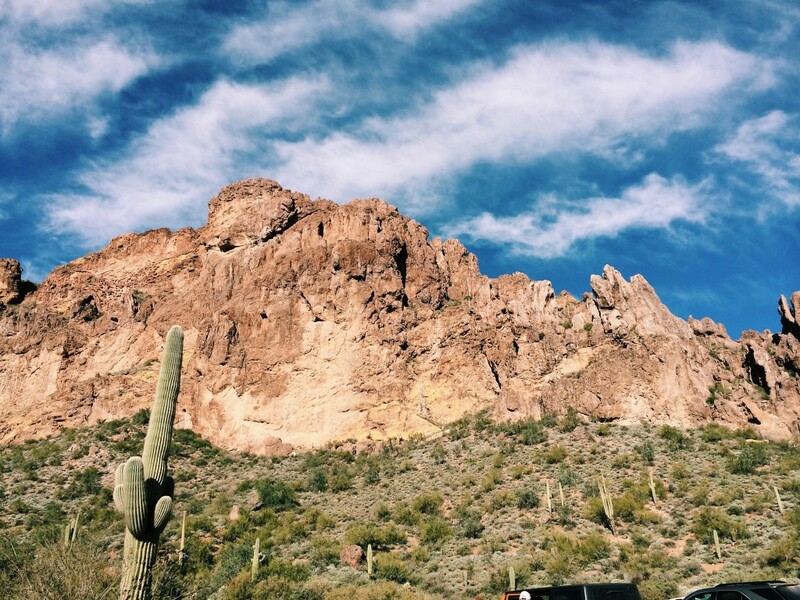 As I’ve grown older I’ve begun to appreciate the landscape of Arizona much more than when I was younger. I disliked everything about the desert when I was growing up here and couldn’t wait to leave it. Looking back now though I’m sure it was just that I was looking for a change. Looking at the familiar landscape now just makes me feel nostalgic and I appreciate the beauty of the desert.